Gretsch G5021E Review – Limited-Edition Penguin Parlor! Launched at Summer NAMM 2018 and released later in winter 2018, the Gretsch G5021E is a celebratory showpiece – which is what we have come to expect from the historic American guitar brand, who don’t let anything out of their factories unless it is oozing retro! Despite the limited-edition nature of this midrange guitar, it has still made its way onto our chart of the best parlor guitars – and today it gets its time in the spotlight! If we had to describe this acoustic in one word, it would be ‘bold’. There is nothing subtle about the G5021E, from the glitzy paintjob to the vertical wing Gretsch logo on the headstock. But in addition to all the aesthetic additions, it’s a fundamentally solid guitar. It features a classic parlor size and shape, with a body length of around 19”. 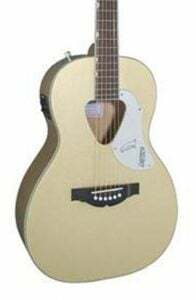 Players familiar with Gretsch’s original and reissue 1950s Rancher guitars will recognize the distinctive triangular soundhole, but otherwise the build is very traditional. The detailing, however, is anything but! Heavily influenced by the original Gretsch Penguin, this limited-edition G5021E has a sparkly Casino Gold finish that covers every inch of the instrument. It’s a unique color and one that certainly catches the eye, along with the silver sparkle binding on the body and neck. It’s applied very well and gives this parlor an extroverted design that will be a big talking point in any guitar collection. In terms of materials, things are pretty standard for the price. There’s a solid spruce top along with laminated maple back and sides. On that note, the neck – which is also enrobed in the Casino Gold finish – is also made from solid maple, and features a comfortable U shape and a rosewood fretboard (which is one of the only things that isn’t painted). 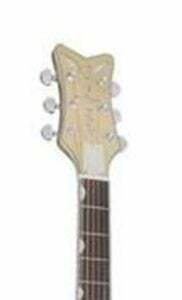 This houses 20 vintage-style frets, with attractive neo-classical pearloid thumbnail inlays. In all the commotion over the striking design, we forgot to mention that the G5021E is an electro-acoustic, with a respected Fishman Presys III system giving it some plugged-in power. This system comprises a piezo pickup, along with a solid little preamp and side-bout control panel. There’s volume, 3-band EQ controls (bass, middle and treble), and a built-in tuner, which is a welcome addition. On the headstock – featuring a cool winged design – sits a set of chrome closed-gear tuners which are accurate and stable. Moving down the body you’ll find a silver plexi pickguard with Penguin decal and an attractive rosewood bridge, which reinforces this stability. 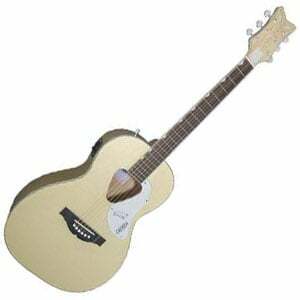 The use of both spruce and maple in this guitar offers an all-round bright tone with good warmth. As a parlor, it retains the boxy, vintage tone you may be craving. While the aesthetics are loud, the guitar has a more modest projection, making it great for vocalists wanting a showpiece instrument to sing along with, wherever you play. Of course, with the Fishman system, it’s built for the stage and sounds great through an amp, with the control panel offering good onboard versatility. The bottom line is that this is a fun guitar from start to finish, with a really unique design that makes for an instant talking point. It’s easy to play, well-made and sounds great. It is a little pricy for a parlor, but the unique design justifies it. If you’re keen, remember that it’s a limited-edition piece, so be sure to pick one up before it’s too late! For more info about the Gretsch G5021E, click here.